You can find plenty of theory about globalisation, but little about the practical reality of working successfully across borders. Based on over thirty years of original research and practical experience, we can help you unleash the full potential of your global teams. Like what we do? Spread the word. How do I lead people who are so far away and different to me? Can I trust my team to make decisions while I am asleep, and will they trust me? How do we balance local and global goals? 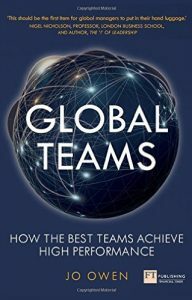 How do I create a sense of team and connection across geographies, time zones and cultures? Conference solutions. We offer keynote speeches and workshops to help you build your global team and global mindset. Team effectiveness. We offer a Global Deployment Programme to help new and existing teams set themselves up for success. Global Best Practices syndicates. We bring together practitioners to share and develop best practice. These can be both single firm and multi-firm syndicates. Jo Owen is a best-selling and multi-award winning leadership author, keynote speaker and social entrepreneur.